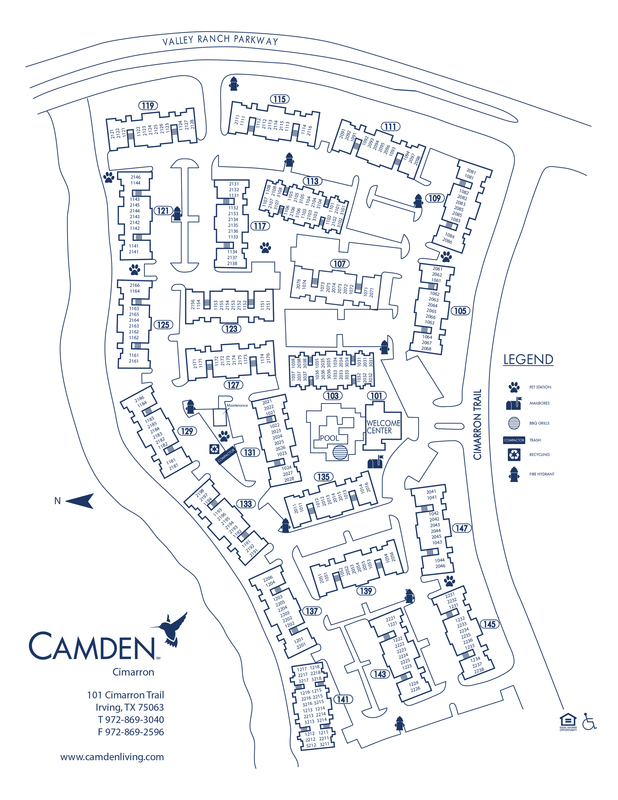 Camden Cimarron offers one and two bedroom apartment homes located in the Valley Ranch neighborhood of Irving. Centrally located between I-635 and President George Bush Turnpike, travel around the DFW metroplex is a breeze from these luxury Irving apartments. Each apartment home at Camden Cimarron includes a chef-inspired kitchen with stainless steel appliances, granite-style countertops, mocha cabinets, brushed nickel hardware and a decorative tile backsplash. Residents also enjoy details like 9-foot ceilings with crown molding, walk-in closets, framed bathroom mirrors, curved shower rods, and washer and dryer. Most floor plans include attached garages and select apartment homes feature hardwood-style flooring, wood-burning fireplaces and scenic canal views from private patios and balconies. For those who enjoy an active lifestyle, Camden Cimarron has the resort-worthy amenities for you! The 24-hour fitness center has everything you need for a full-body workout, including free weights and cardio equipment. Need some time to relax? Head to the swimming pool and nearby hot tub with an outdoor sitting area and stainless steel outdoor grills. Check in on work at the business center with 2 PC computers and a multi-function printer or relax inside the resident lounge with a Keurig coffee bar and TVs. Whether you need to keep in touch or get work done, all the common areas have complimentary WiFi too. Your pets will also love where they live - Camden Cimarron allows up to two pets per apartment home with no weight restriction. And, the community is less than 3 miles from Coppell Dog Park and within walking distance to Animal Hospital of Valley Ranch for all of your pets' needs. Stepping outside your apartment home you will have direct access to the Valley Ranch Canal Trails, known for their beautiful walking trails and parks; plus Campion Trail and Cimarron Park Recreation Center. Our community is walking distance to the Valley Ranch Library, close to fantastic shopping and dining on MacArthur Blvd, and very close to Kroger, Sam's Club, Target, Tom Thumb, and Whole Foods for all of your grocery needs. With close proximity to I-635 and George Bush Turnpike, you're only a quick drive to DFW and Love Field Airports. Residents receive a money-saving technology package through AT&T that includes high-speed internet up to 45 Mbps with WiFi and 300+ digital channels with DVR and access to the U-verse mobile app from any smart device. Whether you enjoy relaxing at home, taking in the scenic canal views or exploring the trails that run through Valley Ranch - Camden Cimarron truly has it all! At Camden, your pets are family too! We welcome cats and dogs, up to two pets per apartment home with no weight restrictions. Call us with any pet-related questions! Most apartment homes include an attached garage. We also offer one parking space per apartment with ample parking for residents and their guests on a first-come, first-served basis.